Flower Power | Cosa Mi Metto??? With the Spring's arrival, flowers are blooming everywhere, and I mean not only on our terraces, in gardens and parks, but also in our closets! This colored and romantic blouse I'm wearing, from Queen's wardrobe, is perfect to welcome the new season! Con l'arrivo della primavera i fiori sbocciano da tutte le parti, e non intendo solo sui nostri terrazzi, giardini e parchi, ma anche nei nostri armadi! Questa colorata e romantica camicia che indosso, di Queen's wardrobe, è perfetta per dare il benvenuto alla nuova stagione! Very nice, I like your bag and blouse a lot!! Very beautiful and stylish... love your yellow heels.. Perfekt!!! Love these shoes soooo much! Mi piace tanto il mood floreale. Bell'outfit: scarpe e borsa mi fanno impazzire! You look gorgeous in this outfit, love the colors! La camicia è troppo carina!!! Adoro la borsa e le scarpe!!! VERY NICE & AMZING LOOK. I like really, you look beatiful...! Feel free to visit me. If you like we can follow each other on facebook, lookbook, bloglovin and via GFC. It would be a pleasure for me. mi piace. oltre non c'è nulla mi piace più il colore negli accessori! I love the pop of yellows! and the bag is super cute! superb colorful outfit, i love it. Of course, let's follow with bloglovin, twitter and facebook. carinissima la camicia, ma anche scarpe e borsa non sono da meno! Bell'outfit!! Gorgeous! one of my fave looks! Ahh! I am obsessed with your bag and the blouse! Love love love! qui mi piace tutto, sei molto carina in queste foto.. Flower power;-) Amazing. Love your shoes! Love your shoes!!! I´m following you, you follow me back? and i love your blog - i follow you now! I love the look. Gorjus. Mi piace questo outfit, i colori sono molto belli! Love your heels, sooo bright and ready for spring! me encanta tu look!!! la blusa en preciosa y los zapatos impresionantes!!! Nice colorful spring outfit. I love flowers on the blouse. Thanks hun! I am now following you on facebook, twitter and bloglovin! I dont have a clue about google + haha! I would love you to do the same for mine! los zapatos de color amarillo son hermosas! ..
La camisa es muy bonita .. me encanta tu elección! I love this bag. I want red one! thanks! i really love your blouse and your bag! Love the top, you look amazing! I envy You the weather! wow, love the lightyellow bag and shoes! shirt is totally gorgeus! Bellissima fino al l'ultimo dettaglio - la manicure e anche i fiori sulle foto ;o)!!! Buona giornata! Xoxo V.V. I love the pop of yellow with the bag and shoes. I especially like the bold pink lip color. You looks simply lovely Audrey! flowers look lovely on you! love your neon, and your shoes! this hairstyle is very good on you! Gorgeous! Your yellow heels and bag look just amazing! I love your outfit! Especially the bag, it's amazing! digging this look so much! i love floral!! n d combo of yellow is superb wit it!!! ...bellissimo questo look...mi piace tanto!!! That is the most delightful floral print...love the pinks and corals on that bright white background...perfect pairing for your yellow shoes! I love that bag! :-O So cute for summer! Cute look! Love your yellow heels! I love your bag!!! It's seems Cambridge Satchel!!! I've just bought a very similar blouse - so pretty and I love your satchel! thank you for the nice comment on my blog & yes, would love to follow each other! hermosa camisa!!!! se vino el verano! wauw love your blouse and shoes! the colours go great together! 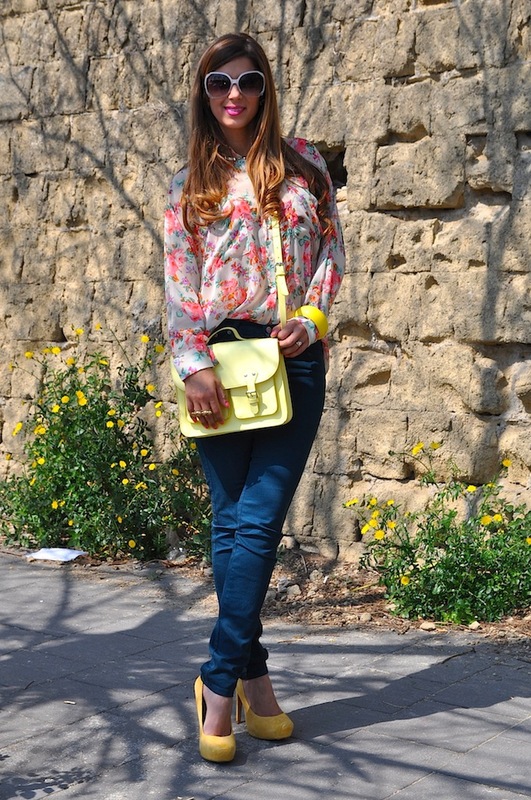 I looove your flowy floral blouse with the pop of sunny yellow in your accessories! What a perfect springtime outfit! that bag and if you click on the link the pic will show up!! Those shoes and that bag are killing me! Love the floral shirt and that neon bag is so fab!! Very fun, springy look! Thanks for visiting my blog dear! Gorgeous outfit post! Love your blouse and heels. I'm going to follow you on twitter and bloglovin. This is just so stunning - one of my favourite looks of yours so far! The floral top is amazing and all the accessories you chose to highlight it are perfection! I'm not really into the flower print, but I do love the neon bag!!! I also like your look, it's more casual than the ones we are used to see on your blog and it suits you really good! Loving all the color here! What a wonderful outfit! Perfect for spring time :) So pretty! pretty look! very nice flower shirt! thanks for droppin by. Love ur shirt, the prints are amazing. THat pops of yellow really bring out the whole outfit to another level! Your purse is too cute!!! Great outfit! I love this bag I have it in white color! Amazing!!! I love the colors of Spring!! you look beautiful dear <3 amazing blouse! I will start to follow you. I love your bag and heels!! now I follow you! Borsa e anello con i cuoricini stupendi! Complimenti per il bellissimo look, stai davvero bene! Fabrizia, you lok amazing. I just love that blouse! i've been wanting to get a pair of yellow shoes for the longest time... love yours! I love your outfit! Florals are the best! And your bag is amazing!! Ahh you're so beautiful! Love the spring palette with the bright florals and accessories. :) Gorgeous! Thank you for your sweet comment! :) I am following you on Bloglovin' too now! I take the last pic to put in our blog, in the section of inspirations! ah I'm loving the yellow! gorgeous floral top and loving the pops of yellow! love your bag and earrings! great outfit! im you newest follower! ahh, yellow is one of my favorite colors ever! love the shoes and bag, too cute. Thank you so much! It would be a great pleasure to me! Your shoes ! Your bag ! Your shirt ! I definitely love that style and those outfit ! Love the outfit! Esoecially the yellow details!! love the satchel, really liked your blog!! Lovely outfit! Thanks for your lovely comment, would be very nice to follow each other:) Im following u now via google! hey! come to check out my blog! LOVE your look! You are so impeccably put together...in a fun and interesting way. I too am adoring floral print right now....and neon, love that you put the two trends together!